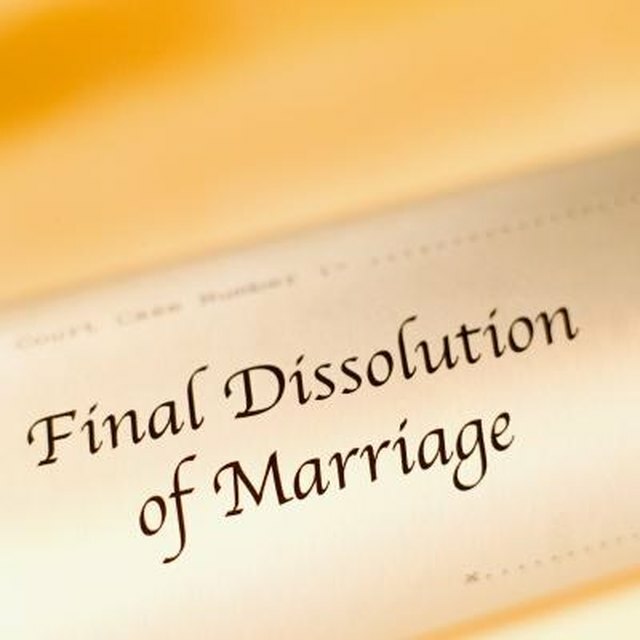 Can I File for a Deed-in-Lieu if I Get a Divorce? When applying for a mortgage, married couples often obtain the loan and take title to the home jointly. Issues of ownership and responsibility can get complicated in a divorce, especially when a risk of foreclosure exists. Although divorcing co-borrowers may want to walk away from their marital home, getting rid of the mortgage obligation isn't easy, especially in a down market. A home can end up in foreclosure as the result of financial hardship from divorce. The court often decides who keeps the home and who remains responsible for payments in a divorce. It may require the couple to sell their marital home if neither spouse wants or can afford to keep it. In a housing slump, when home values decline and the couple owes more on the home than it is worth, they may ask their lender to do a short sale. If the lender cannot make the loan affordable for one of the spouses through refinance or loan modification, it may allow them to sell for an amount that falls short of paying off the debt. A short sale helps divorcing borrowers get rid of the loan obligation and avoid foreclosure, but hurts the borrowers' credit. In the event that the spouse who retained sole ownership of the marital home stops making payments after the divorce, the other former spouse is still responsible for repayment if he remained on the loan. It does not matter that he no longer lives there. The lender repossesses the home and forecloses on the mortgage loan. Because both borrowers remained responsible for the loan, a foreclosure would damage both their credit scores and the mortgage account would reflect "foreclosure" on both reports. To prevent foreclosure after a divorce, the spouse who plans to live in the home or remain responsible for paying the mortgage can refinance the loan into her name only. In doing so, she removes the former spouse from the responsibility of making future payments and must rely on her own credit and finances to obtain the new loan. The lender typically requires that a non-borrowing former spouse also quit claim to the property. In the event that a non-borrowing spouse is awarded the home in a divorce, the spouse responsible on the loan must continue making payments or risk foreclosure with the bank and legal problems with the fomrer spouse for breaking their agreement to continue payments. Can My Ex-Husband's High Income Stop a Short Sale? How Long do Foreclosures Stay on Your Record? The financial consequences of divorce and foreclosure affect your ability to get another mortgage. Mortgage lenders include alimony and child support obligations in debt-to-income (DTI) calculations. The DTI ratio compares your monthly expenses to gross income. Lenders require you to wait three to seven years after a foreclosure before approving a new loan. The exact seasoning requirement varies by loan type, down payment contribution and the circumstances which led to your foreclosure. Lenders may waive the waiting period if a spouse's death or serious illness led to foreclosure. Divorce, however, is not an extenuating circumstance under which lenders waive seasoning periods.